Symbiotics work with a range of specialist police forces to help with the assessment and selection of police candidates for role advancement and particular deployments. This includes firearms, surveillance and protection officers from a range of forces across the country. We run a number of bespoke tests, including behavioural simulations that are context-specific to the police. These tests assess candidates against a role or organisational profile ensuring that they are a suitable fit for the position. Our proven assessment programme works for different roles and seniorities, informing the pre-selection process and training decisions as well as filtering potentially unsuccessful candidates. Firearms Officer's training courses tend to run at a success rate of between 40% and 60% nationwide. South Wales Police success rate for the firearms officer course is standing at 90% due to the use of our Police pre-selection and assessment process. Symbiotics staff have worked with the specialist police forces to understand the key attributes successful individuals have and also the attributes that if present prevent the person from being effective in a high stress situation. Our Team then developed bespoke simulations that covertly tests for these traits, placing the candidates into scenarios and monitoring (both digitally and via observation) how they perform. The results of all the tests, assessments, observations are fed into a complex model that determines the candidate's suitability for the role and provides feedback on the candidate and how they are likely to perform if they enter the full training program. Our pre-selection process for the police helps to reduce training costs and hours whilst providing more robust and flexible candidates likely to succeed in training to the police forces. Click here to see our recommended test portfolio for the police. Our police assessment day puts candidates through a variety of tasks designed to identify and examine traits and skills that relate specifically to the role in question. Comprising of aspects including a group activity, behavioural simulation assessment, interview, debrief and cognitive testing; the output is a report that breaks down different areas of application and provides a recommendation or likelihood to succeed for each candidate. The reports are colour-coded for ease of understanding and identifying weak areas and traits for development. Symbiotics have an existing range of assessments specially designed for police forces, but if required can develop new scenarios and assessments using our team of ex Police and security experts to tailor the scenarios to real life situations, capable of identifying the critical traits and attributes of the ideal candidate. 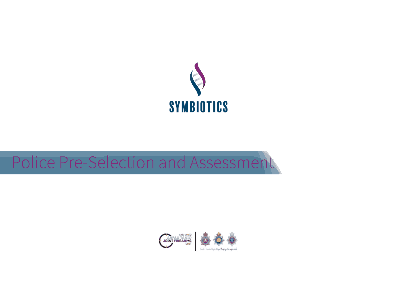 Being able to identify a range of traits and skills, Symbiotics are able to effectively inform the selection process and help reduce the costs of progress candidates that are not yet ready for these high stress roles. Symbiotics are aware that people change over time and the feedback from these assessments can help inform the candidate on key skills to work on so that they are better candidates for any future roles or re-assessment they may attend. Click here to find out more about our police assessments. Symbiotics provide police-specific training for investigative skills and interviewing, allowing forces and individuals to develop their knowledge and skills in these areas. We train officers with the skills they require; if called as witnesses, to conduct investigative interviewing or to cover the latest evidencing and procedural updates. Our team of industry experts provide espoke police training in each of these specific skill areas, drawing on their own experience. Click here to find out more about our specialised police training courses.